Its 2001 Dodge Ram, vehicle starts and runs fine,but while slowing sown it will not downshift from second to 1st gear to make a stop.It normally gives problem when engine is hot. Manually shift to D1, D2 and D and the transmission operates normally. Local mechanic suggested faulty Throttle position sensor which is already been replaced with brand new OEM part,but still same problem. As per problem mentioned it seems like 1-2 shift valve in the valve body is staying in the second gear position rather than returning to the first gear position when you come to a stop. So its not downshifting to 1st gear. So first possibility is valve body issue. Valve is physically sticking in the bore because of bore or valve damage. Or its debris in the valve causing it. Sometimes valves in a valve body will start to hang up more when hot which may explain why yours seems to only act up hot. Governor pressure staying too high from its actual level. On the right side of the valve body is the governor solenoid and transducer which are used to control governor pressure. Governor pressure acts against one side of the shift valves in the valve body to control up and downshift timing. May be that required pressure is not there. HOW EXACTLY GOVERNOR PRESSURE IS CREATED? This is all done by solenoid.The solenoid is used to control line pressure flow into the governor circuit to create more or less pressure, the transducer is the engine controller's feedback so it knows how much pressure is in the circuit. What usually causes your problem is a bad governor pressure transducer. What will happen is they start to report a lower pressure than actual. So vehicle has downshift issue.On your case its related 1st gear.but this problem can vary,it can be second gear issue.You never know,but all seems to be related to governor pressure transducer. HOW EXACTLY VEHICLE DOWN SHIFT PROCEDURE WORKS? Governor pressure should be 0 when you are stopped and build at a rate of about 1 PSI for every MPH you are traveling. Now if governor pressure stays up when you come to a stop then it will still be acting on one side of the shift valves, there will be no throttle pressure on the other side of the valves to counteract it, and it hangs in second or sometimes third gear when you come to a stop. So it will not set in correct gears. HOW TO CONFIRM THE FAULT WITH GOVERNOR PRESSURE? You can get the issue confirmed by watching governor pressure on a scan tool and comparing it to pressure shown on a manual gauge, but if you don't have a scan tool available then its suggested to just replace the transducer. It's easy to replace and mounted just to the right of the filter on the right side of the valve body, it takes around an hour to replace. Majority of the time this will take care of the problem you are having, and if you're looking to avoid a shop I would recommend replacing the transducer. It can be easily replaced with basic auto repair tool kit,yes that is must. But please make sure you buy branded auto parts,as compared to third grade low quality cheap aftermarket parts. WHAT IS PART NUMBER FOR TRANSDUCER? The current part number is 68164850AA and it runs for approx $100 at a dealer. The other good option is you can order it from moparonlineparts.com and get the same Mopar part for $65 and save a few dollars. Problem noticed on 2006 Chrysler Town & Country. First of all please confirm that when the light illuminates, do you have anything sitting on the passenger seat? The possibility for this problem to occur can be issue with sensor. The call back sensor by the bumper. The sensors out under the bumper cover area are the impact sensors. If there was a problem with them then the airbag light would be coming on and not just the passenger airbag lamp disable light. But in your case only passenger side air bag light is coming ON.But still inspect the impact sensors. But as per the problem mentioned the passenger airbag light will come on when there are certain amounts of weight in the seat or when there is an issue with that part of the system. The first thing that needs to be done is see if there are any fault codes storing in the airbag module and occupant classification module. The occupant classification module (OCM) is the module that monitors the weight in the passenger seat. Get this module scanned to confirm if there is any error code stored.That will help you troubleshoot the problem further. Now the main issue.Which is mostly seen on such cases.Inside the right front seat there is a bladder type weight sensor that weighs the passenger and the OCM determines how hard the airbag should be deployed. If the light is coming on it's because the sensor is reporting a weight in the seat under 100 pounds or there is a fault code setting. If there are no codes stored in the module and no weight is being put in the seat at the times the light is on then either the OCM or the weight sensor could be bad, more likely it would be the sensor. If this was the case then it would need to be diagnosed while it's acting up which sounds like it's going to be tough to do. Because when problem is not there,you cannot confirm the fault. If you are under 100 pounds and the light comes on with you in the seat, or if there is something fairly heavy but under 100 pounds in the seat when it comes ON. "SEAT WEIGHT SENSOR WIRING DIAGRAM"
HOW TO DISARM AND REMOVE AIRBAG? Turn signal works ok,but problem starts after vehicle sits overnight.So its intermittent problem.Also while driving it feels like vehicle pulls. 2008 Chrysler town and country mini van: Sliding Door Not Working? First inspect the fuse controlling sliding door. Left sliding door module is powered by fuse J11 and it's a 30 amp fuse. The fuse box is located under the hood right next to the battery. On the fuse box lid you will see diagram showing all the fuse location numbers. Find J11 on the diagram of the locations and then you can locate the fuse in the box. Take a look at the fuse and see if it looks ok visually. Another possibility to check fuse is by voltmeter.If you have a voltmeter you can check continuity of the fuse to make sure it's blown, or you can swap it out with any other 30 amp fuse in the box and then see if the door starts working again. Once in a while a fuse can be broken or blown in a way that's not easy to see by eye, if you test it or swap it with another then you can be sure you've ruled the fuse out.So try it before you are confirm its working or not. If there is no power at all to the electrically operated sliding door then its faulty fuse.If the fuse is working then it can be faulty sliding door switch or its wiring issue. Front Door dis-assembly diagram for Toyota car? Rear Door dis-assembly diagram for Toyota car? How to test Power door locks? 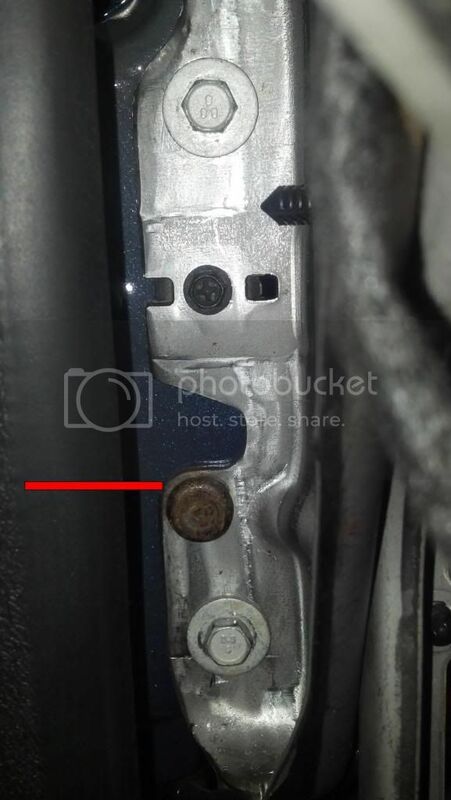 2000 Toyota Corolla: Rear Door wont open from outside or inside? Alternator already replace with no difference in problem. On dodge vehicle models the charging system, transmission, a/c and cruise control functions all are controlled by PCM. PCM is also called as powertrain control module. PCM is the module mounted behind the airbox on the firewall. Now as per what the details are mentioned transmission shifts and if the fuel gauge still works we can assume the PCM is still up and functional. If the fuel gauge did stop working at the same time as the tach and charging system then most probably the issue is faulty PCM.Still it has to be checked,but mostly its PCM. The alternator receives voltage from the ASD relay and then charging is controlled by the PCM. The PCM turns the ASD relay on only when it knows the engine is running. Other thing can be faulty Crank Sensor.Which i think is most possible. On the timing cover just above the crank damper is the crankshaft position sensor. The crank sensor runs off the crank damper and tells the PCM the engine's speed. When the PCM sees a signal from the crank sensor it will turn the ASD relay on and the alternator can charge. The crank sensor is also what allows the tach to work, it's the only input for engine speed. Also tach and charging functions both rely on the crank sensor's signal and these were the only two things lost at the same time it's very likely that you have a bad crank sensor. HOW TO TEST CRANK SENSOR? It can be tested with a digital voltmeter, although it is somewhat hard to get to in the close quarters. If you don't have the means to test it then I would do a visual inspection of the wiring and connection, and replace the sensor if all looks ok. DETAILS ABOUT PCM AND TIMING COVER? The PCM is the powertrain control module already mentioned before.Its a silver rectangular module mounted on the firewall behind the airbox. It has three 32-way electrical connectors. This is the best indication to locate it. The timing cover is the thin black steel cover on the front of the engine. The crank damper is the large pulley on the front of the engine, easiest seen from the bottom. It's the largest pulley and is the one coming directly from the engine itself. You will see some wires coming from a harness at the front of the motor leading down past the waterpump going to the sensor. The wiring to the crank sensor will run right down past the water pump area and the sensor mounts to the timing cover below the pump area. The crank sensor is the only thing electrical up there. 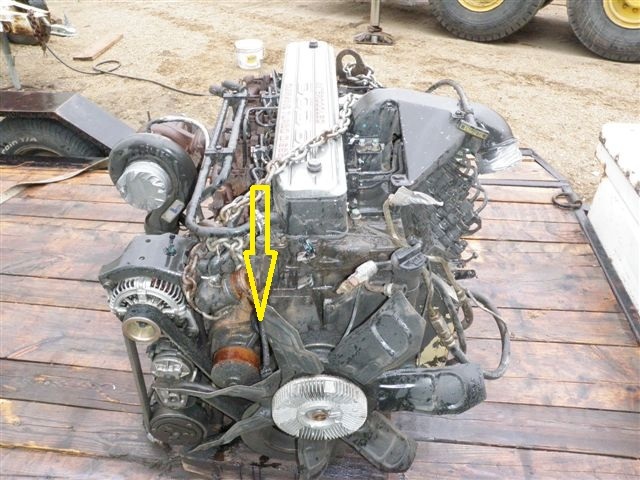 View the actual picture of a 12 valve Cummins with an arrow drawn to the crank sensor wiring. Mostly it seems faulty crank sensor but if all control function stopped working then it can also be faulty PCM. These details will help you. Where is Crankshaft position sensor located on Toyota Tundra? Ford Focus Crankshaft Position (CKP) Sensor? General Information For vehicle charging system? The door ajar switches are integral to the front door latches.Its very common and very famous problem, noticed by many others too. WHY DOOR AJAR LIGHT COMES ON? The ajar switch signal goes to the instrument cluster which also serves as the body control module. When the ajar switches close it applies ground to the circuit, the cluster sees this and turns on the interior lamps and the door ajar warning. WHAT YOU HAVE TO SEE AND CHECK? Inspect the front doors,are they closing properly or there seems to be difficulty to close the doors.Or there is any kind of blockage to the door area. If your doors are closing properly, then unplug the door latch and see if warning light goes OFF or not. Even after unplugging the latches doesn't turn the warning off then either the problem is internal in the instrument cluster or both of these ajar circuits are shorted to grounds somewhere in the wiring harness. The wires may be pinched or rubbed through on a grounded component, or it could even be from moisture in an electrical connector. There are many possibilities,check for all basics mentioned. What you'll need to do next is check for a short to ground on both of these ajar circuits.If you find the ajar circuits are shorted to ground then unplug the cluster and see if the short goes away. If it does then the short is in the cluster and it will need to be replaced. BUT, if the short is still there with the cluster unplugged then the problem is somewhere in the harness between the cluster and each of the doors.You will have to follow wire by wire to trace the faulty wire. You can also use test light to check continuity to the wires. On shorted wire you will not get continuity. Many automotive parts stores have alternator bench testers available for use by customers. An alternator bench test is the most definite way to determine the condition of your alternator.So its advisable to first test and get confirmed that alternator is faulty. Also there is way to test the Alternator. The easiest way to test the performance of the alternator is to perform a regulated voltage test. Connect a voltmeter between the positive and negative terminals of the battery. Voltage should be 14.1-14.7 volts. If voltage is higher or lower than specification, connect a voltmeter between the battery positive (B+) voltage output terminal of the alternator and a good engine ground. If voltage is still out of specification, a problem exists in the alternator or voltage regulator. If voltage is now within specification, a problem exists in the wiring to the battery or in the battery itself. This testing will help you to confirm the alternator is working or not. Once its confirmed that alternator is faulty, you can go for replacing it. Disconnect the negative battery cable, for safety purposes. Remove the right side splash guard from under the vehicle. Disconnect the alternator lead wires and connections. Label them if you are unsure of their locations. Keep marker pen ready to mark the position of wire.This helps while reconnecting. Loosen the drive belt adjusting bolt and slip the belt off the pulley. Remove the lower adjustment bolt, followed by the upper pivot bolt. Lower the alternator from the vehicle. Using a C-clamp and a socket, push the upper pivot bushing back in it's bore until it bottoms out. Raise the alternator into the engine bracket, and push the upper pivot bolt all the way through the bracket to support it. Install the lower adjustment bolt, followed by the upper pivot nut. Place the belt on the alternator pulley, and tighten the belt. Tighten the upper and lower mounting bolts. Engage the alternator lead wires and connections. Start the vehicle, and check for proper operation. Readjust the belt tension, if necessary. Install the lower splash guard. Proper belt tension is important. A belt that is too tight may cause alternator bearing failure; one that is too loose will cause a gradual battery discharge and/or belt slippage, resulting in belt breakage from overheating. Never reverse the battery connections. Booster batteries for starting must be connected properly: positive-to-positive and negative-to-ground. Disconnect the battery cables before using a fast charger; the charger has a tendency to force current through the diodes in the opposite direction for which they were designed. This burns out the diodes. Never use a fast charger as a booster for starting the vehicle. Never disconnect the voltage regulator while the engine is running. Avoid long soldering times when replacing diodes or transistors. Prolonged heat is damaging to AC generators. Do not use test lamps of more than 12 volts for checking diode continuity. Do not short across or ground any of the terminals on the AC generator. The polarity of the battery, generator, and regulator must be matched and considered before making any electrical connections within the system. Never operate the alternator on an open circuit. Make sure that all connections within the circuit are clean and tight. Disconnect the battery terminals when performing any service on the electrical system. This will eliminate the possibility of accidental reversal of polarity. Disconnect the battery if arc welding is to be done on any part of the vehicle.